For other people named Joe Wright, see Joe Wright (disambiguation). Joseph "Joe" Wright (born 25 August 1972) is an English film director known for the romance film Pride & Prejudice (2005), the romantic drama war film Atonement (2007), the action thriller Hanna (2011), and his 2012 adaptation of the classic Anna Karenina. His most recent film, Pan, is a Peter Pan origin story. Darkest Hour, Wright's political drama about Winston Churchill, will be released in 2017. Wright was born on 25 August 1972 in London, where his parents, John and Lyndie, founded the Little Angel Theatre, a puppet theatre in Islington. Wright always had an interest in the arts, especially painting. He would also make films on his Super 8 camera as well as spend time in the evenings acting in a drama club. Wright is dyslexic. He left school without any GCSEs. He began his career working at his parents' puppet theatre. He also took classes at the Anna Scher Theatre School and acted professionally on stage and camera. He spent an art foundation year at Camberwell College of Arts, before taking a degree in fine art and film at Central St Martins. In his last year of studies he received a scholarship to make a short film for the BBC that won several awards. On the success of the short, he was offered the script for the serial Nature Boy. He followed this up with the serials Bodily Harm with Timothy Spall, and the highly acclaimed Charles II: The Power and The Passion with Rufus Sewell which won the BAFTA Award for Best Drama Serial. During the 1990s he worked at Oil Factory, a music video production company based in Caledonian Road, Kings Cross. He worked on a variety of productions in numerous roles, including casting director. Here he was able to get the opportunity to direct some music videos. Alongside this, particularly on the strength of his short film work, he was also developing The End, his second short film. During this decade Wright also worked part-time as a roadie for Vegetable Vision who created visuals for various electronic music bands, such as Chemical Brothers, Darren Emerson, Underworld and Andrew Weatherall. He attributes some of the aesthetic and emotion of the UK rave scene as an influence on his work. In 2007, Wright became engaged to actress Rosamund Pike, yet the wedding was called off in 2008. Wright is married to sitarist Anoushka Shankar, daughter of Ravi Shankar and half-sister of Norah Jones. They have two sons; Zubin Shankar Wright, who was born in February 2011, and Mohan Shankar Wright, who was born in February 2015. In 2005 he made the transition to feature films with the critically acclaimed adaptation of Pride & Prejudice starring Keira Knightley and Matthew Macfadyen. The film received numerous accolades including 4 Academy Award nominations (including Best Actress), 6 BAFTA nominations (Wright won the BAFTA for most promising newcomer) among a host of other nominations and wins. Wright's next feature was an adaptation of Ian McEwan's Booker Prize shortlisted novel Atonement, which was released in 2007, reuniting Wright with Keira Knightley, and also stars James McAvoy. On 13 December 2007, the film was nominated for seven Golden Globe Awards, more than any other film that year. Though Wright himself was not nominated for director, the film received seven Academy Award nominations, winning only for Best Original Score. At the BAFTA Awards it received 14 nominations and went on to win for Best Production Design and Best Film. His next film was The Soloist which stars Jamie Foxx and Robert Downey, Jr. It is about the "true story of musical prodigy Nathaniel Ayers, who developed schizophrenia in his second year at Juilliard and ended up homeless on the streets of downtown L.A. where he performs the violin and cello." It was to be released on 21 November 2008; however the release date was pushed back to 24 April 2009. Wright reunited with Atonement star Saoirse Ronan for the action thriller Hanna. The title character is a 15-year-old girl trained since birth to be an assassin by her father (Eric Bana), a rogue CIA asset. The movie received mostly positive reviews with Roger Ebert calling it a "first rate thriller" in his review The film received an aggregate score of 65 from Metacritic, meaning it received generally positive reviews. Wright directed the 2012 screen adaptation of Leo Tolstoy's classic novel Anna Karenina. The cast included Keira Knightley as Anna, Jude Law as her husband, Aaron Taylor-Johnson as her young love, Irish actor Domhnall Gleeson as Konstantin Levin, as well as Kelly Macdonald, Olivia Williams, Matthew Macfadyen, and Michelle Dockery. Saoirse Ronan and Andrea Riseborough were initially cast in the film, but dropped out and were replaced by Alicia Vikander and Ruth Wilson, respectively. Wright then directed the 2015 prequel to Peter Pan for Warner Bros. The film starred Hugh Jackman, Garrett Hedlund, Rooney Mara, Amanda Seyfried and Levi Miller as Peter. The screenplay by actor-turned-screenwriter Jason Fuchs was from the 2013 Hollywood Blacklist, a selection of popular unproduced scripts. Rooney Mara's casting as Tiger Lily did cause a controversy, due to her being of European ancestry, while Tiger Lily is traditionally portrayed as a Native American. Set for a 2017 release, Darkest Hour covers a pivotal month in the life of former British Prime Minister Winston Churchill. The film stars Gary Oldman as Churchill, along with Ben Mendelsohn, John Hurt, Kristin Scott Thomas and Lily James. Wright has distinguished himself as a director, winning a BAFTA award for best newcomer for Pride & Prejudice and becoming the youngest director ever to have a film open the Venice Film Festival with Atonement. According to the director's commentary on Pride & Prejudice, Wright is influenced by the work of British film director David Lean, and possessing a certain knowledge of art history, tries sometimes to compose his shots after classical paintings. Charles II: The Power and The Passion, Pride & Prejudice, Atonement and Hanna all have long tracking shots in them. Atonement has a continuous 5 minute and 5 second shot of the Dunkirk evacuation. "Basically, I just like showing off", Wright told the audience at the Hay Festival. ↑ "Garrett Hedlund Offered Captain Hook Role in 'Pan'". ↑ "Joe Wright bio". tribute.ca. Retrieved 25 December 2009. Quote: "He took improv workshops at the Anna Scher Theatre, and with his portfolio of paintings and Super 8 films, was accepted into Camberwell School of the Arts." ↑ Greenstreet, Rosanna (August 3, 2013). "Q & A with Joe Wright". The Guardian. ↑ "It's all about bums on seats – interview with Joe Wright". London: Guardian. 10 February 2008. Retrieved 25 December 2009. ↑ Barber, Lynn (May 23, 2009). ""I don't sleep around, if that's what you mean ... Would you like some more cake?"". The Guardian. ↑ FLEMING, MICHAEL (16 August 2007). "Jamie Foxx tunes up for 'Soloist': Oscar winner to star in DreamWorks drama". Variety. Retrieved 25 December 2009. ↑ "Critic Reviews for Hanna". Metacritic. 2011-04-08. Retrieved 2012-06-18. ↑ Germain Lussier (4 June 2011). "Joe Wright's 'Anna Karenina' Welcomes Saoirse Ronan, Kelly Macdonald, Olivia Williams And More". Slashfilm. Retrieved 23 August 2011. ↑ Baz Bamigboye (19 November 2010). "Keira Knightley tipped to star in remake of Tolstoy's tearjerker Anna Karenina". Daily Mail. London. Retrieved 23 August 2011. ↑ "Domhnall Gleeson Lands Role in Joe Wright's 'Anna Karenina'". IFTN. Retrieved 13 June 2011. ↑ Patrick Collinson (29 July 2011). "Fancy owning a piece of film history?". London: The Guardian. Retrieved 23 August 2011. ↑ Nigel M Smith (18 August 2011). "Andrea Riseborough Talks Madonna, RADA and "Brighton Rock": What's Next". Indie Wire. Retrieved 23 August 2011. ↑ "Tannishtha Chatterjee joins Jude Law's film". The Times Of India. 10 October 2011. ↑ "The Black List Announces 2013 Screenplays (Complete List)". Variety. December 16, 2013. Retrieved July 28, 2014. ↑ Perlman, Jake (March 13, 2014). "Rooney Mara as 'Peter Pan's' Tiger Lily: A look at the controversy | PopWatch | EW.com". Popwatch.ew.com. Retrieved July 28, 2014. ↑ Vo, Alex (14 September 2007). "Toronto Film Fest: An Interview with Atonement Director Joe Wright". Rotten Tomatoes. Retrieved 25 December 2009. ↑ Brooks, Xan (3 June 2007). "Hay festival: Atonement looks mightily impressive". London: guardian.co.uk. Retrieved 25 December 2009. 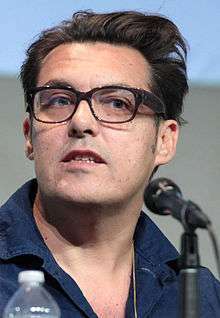 Wikimedia Commons has media related to Joe Wright.